Peter Pan Ice Cream glass lantern slide advertising for cinemas, made between 1958-1961, probably by Andy Keen. Courtesy of the Denne family collection. Some months ago now, I was kindly invited by Auckland-based historian Lisa Truttman to pen an article for NZ Legacy Magazine, the official journal of the New Zealand Federation of Historical Societies, Aotearoa’s longest running heritage publication. Lisa has been a fantastic supporter of my work on the Longwhitekid project, and it was an honour to fulfil her request. A reconfigured version was published, of a story I had previously posted on this blog back in early April 9, 2012, entitled “How it All Pans Out” – about T.C. Denne’s soft drink and ice cream business. There has been quite a resurgence of interest lately, propelled by a company reunion, which has been organised for November the 2nd of this year; and Central Hawkes Bay Settler’s Museum are also having an exhibition on the topic to coincide with this – it opens after the 1st November and runs until 26th January 2014. It’s nice to think that this is all happening just a few months shy of what would be the 100th year since the establishment of the Denne Drinks business; an anniversary celebration, if you will. During the year a stack of information had come in from various sources to add to the history of Denne Drinks and Peter Pan; so as a result I pretty much had to start from scratch and rewrite the whole thing, then edit it back down to the 2000 words required. The Legacy version was still not complete and posed a number of major questions regarding the story (since resolved). Subsequently, I ended up with the full version of the story at 12,000 words, just sitting around. Wondering what to do with it, since it was now way too big to post to this blog – it seemed only fitting really to do a bit of a rewrite, add all the images I’ve made or gathered up during the course of my research, and publish it as a small book about the company and Denne family history, so that people attending the reunion and exhibition could buy and enjoy it. Foolishly, I thought I was going to be able to achieve this and have it ready during the last four weeks of the school semester, not realising that I had a very long list of assignments yet to do. Nearly complete, and suddenly realising I was cutting it pretty fine -I decided to postpone it rather than fail my course. What was I thinking? Not much, apparently. Anyway I am not sure when the book will now ever see the light of day, if at all. However, you can buy Peter Pan cards in my Redbubble store here. Certainly since this article was published, it now seems it falls quite short – given what knowledge I have gained of of the missing pieces of the story – but here it is anyway, with a few extra images. This appeared in the Vol 25, No 1 edition of Legacy which was in-store January 2013. Enjoy. Two trucks, a 1928 Dodge and a Chevrolet, emblazoned with the company name and packed full of neat rows of stoneware crocks, sit outside the original Waipukurau factory in 1930-1931. Courtesy of the Denne family collection. I never fail to be surprised that something that has been a long part of people’s lives disappears so rapidly, but doesn’t fade from one’s memory so quickly. Mention ‘Peter Pan’, and most remember it as being famous for their cold confections. 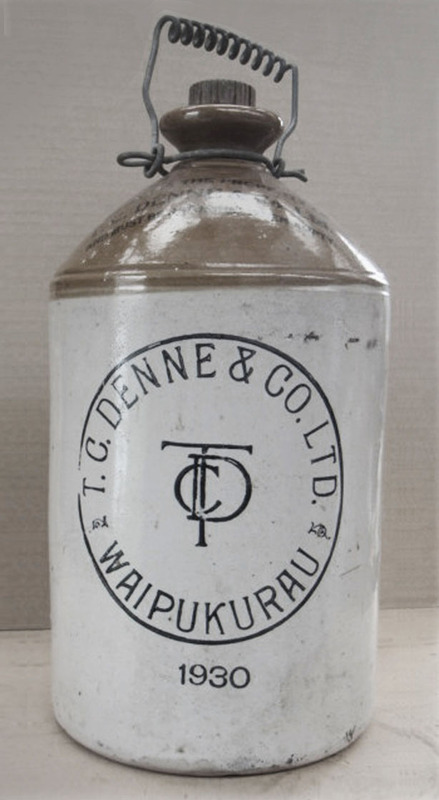 The brand originally came from T C (Thomas Clement) Denne’s soft drink business. T C’s parents arrived in New Zealand from Kent in 1875 and settled in Mataura in Southland, where T C was born in 1881. Railway advertisement, circa 1968. Artist: Unknown, NZ Railway Studios, Painting and collage on board, 225 x 420mm. Reproduced courtesy of Archives New Zealand The Department of Internal Affairs Te Tari Taiwhenua, Reference: AAAA 20991 W5860 1 F.
At fifteen, he was seriously injured in a local paper mill – his hand de-gloved between rollers, necessitating grafts. The family were still in Mataura in 1902, but by 1904, T C was in Milton; secretary then deputy conductor of the brass band. Music was to remain a life-long love and any lingering effects of his accident did not impede his endeavours. The family had moved to the logging town Horopito in the King Country by 1908 and T C commenced business with John Madsen. They purchased a number of sections in 1908-1909 and are described as storekeepers; a photograph shows both standing outside premises they had at National Park. Their shops thrived with the communities benefitting from the boom in the timber industry – spurred by the completion of the Main Trunk railway line in 1908. 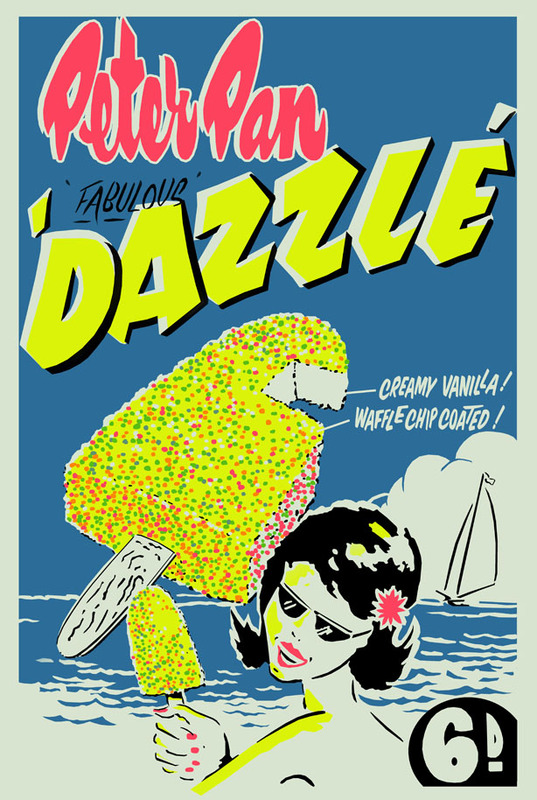 Recreation of a mid-1960s hand screen-printed poster for the Peter Pan Dazzle, by Bob Godfrey. By 1912 the relationship had dissolved. Denne sold his part “to take up another business closer to town” and this was likely his entrée into soft drinks. A 1908 report mentions “numerous cordial proprietors of Horopito, charged with selling over-proof [alcoholic] product”. T C perhaps acquired one of these concerns and to learn the trade quickly he sat at someone’s knee. In 1913, he married Agnes Morris and his last mention in the area was in February 1914, in a letter to the Crown Lands department in which he refused to pay arrears. Extraordinarily confident, he mastered brewing, extraction and aeration and set up two factories expeditiously. In 1914, T C appeared in Queen Street, Masterton. An advertisement in January 1915 depicts ‘Denne’s Aerated Waterworks’ and a factory producing soda water, non-alcoholic ale and beer, and cordials. Simultaneously he was producing vinegar in Eketahuna, although the family say this was his first business. “Eketahuna had this beautiful spring, hence the factory there”, says Yvonne Sutton, T C’s granddaughter. 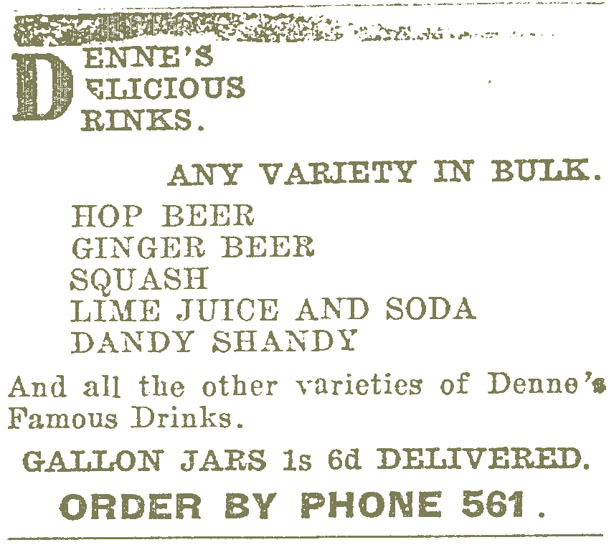 Denne’s Delicious Drinks, Wairarapa Daily Times, 23 December 1916, Page 8. 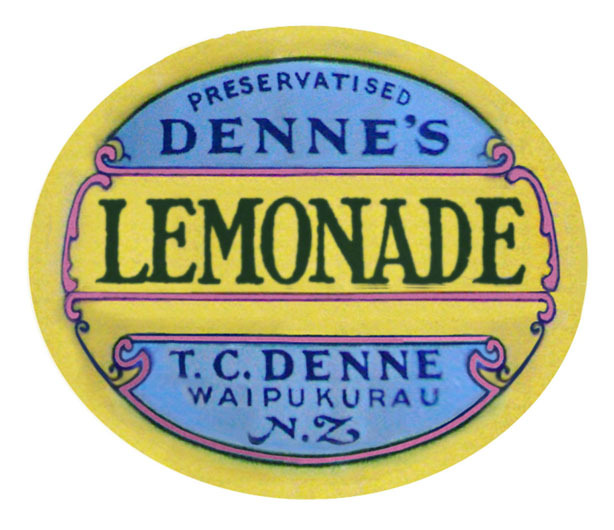 Between 1916 and 1919 advertisements for ‘Denne’s Delicious Drinks’ make mention of the ‘dry district’ of Wairarapa. That electorate banned alcohol from 1908 to 1946, so fermented drinks were booze-free, and his move to the area likely reflected his devout Seventh-day Adventism. By 1917, he was conducting Masterton’s Silver and Brass Bands. In 1919 he quit “for business reasons”, and sold his factory which was then renamed ‘Crystal Springs’ by partners Neill Wotton. T C departed for good, being publicly presented with an engraved conductor’s baton. Recreation of a mid-1960s hand screen-printed poster for the Peter Pan Blueberry, by Bob Godfrey. His business carried on at Eketahuna – a factory receipt proves his residence there until July 1926. In Waipukurau, he immediately established a new factory. In 1929, looking to expand, T C purchased ice cream equipment from Lionel Swain in Waipawa. Swain also suggested the brand name ‘Peter Pan’ – although it was used from the mid 1930s, it was only trademarked in 1946. 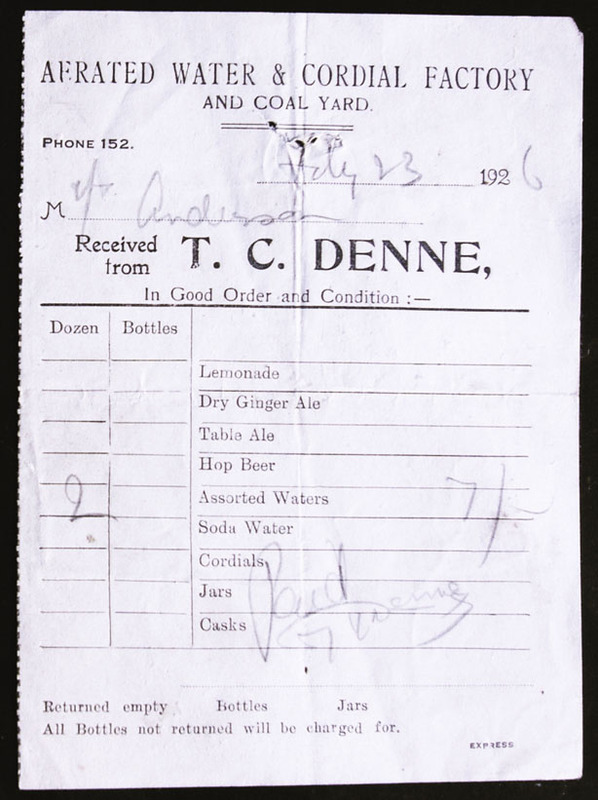 Denne’s Drinks and Coal Yard, reciept from Eketahuna factory, July 1926. Image courtesy Tony Smith collection. It was early days in the industry and T C built a 16-foot lean-to, as he assumed he would have only a limited market. Ice cream was initially churned in a bucket and sold in bulk. Soon after, T C’s son Tom (Thomas Vernon Denne 1916-1983) joined the business. The 1930s saw smooth growth, unimpeded by the economic depression, but certainly plans were being made to establish a permanent ice cream business. The Tokomaru Steam Engine Museum have a 1937 ‘Sisson’ model, bought from the Dennes – “acquired 1967, a generator for power cuts, never used”. Dependent on local dairy cattle for the first decade, the company’s rapid growth meant ingredients had to be shipped in. By 1940, ice cream had usurped the soft drink business – so that part of the business was sold. 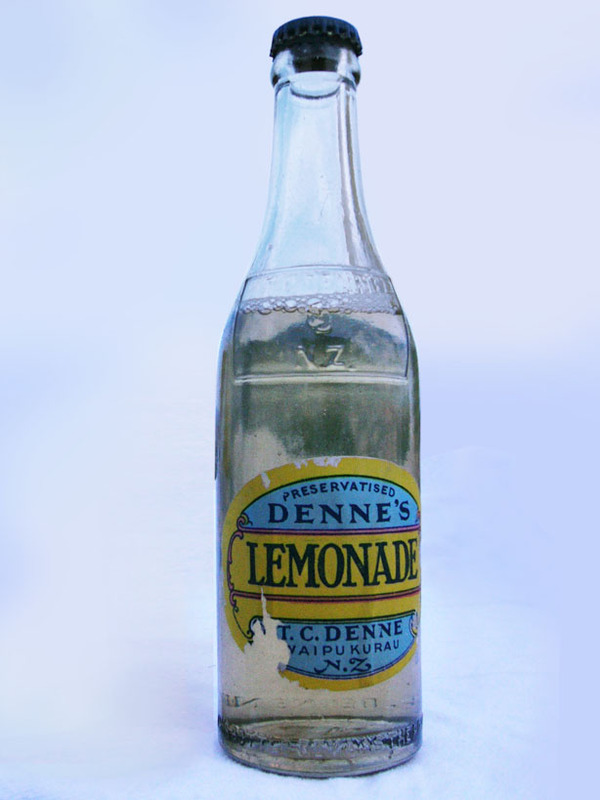 Denne’s soft drink bottle with original contents ad label intact, produced between 1928-1938. Image courtesy Tony Smith collection. The first ‘novelty’ product, the ‘Peter Pan Pie’, arrived in 1945. Even with automated machinery, the ice creams were hand wrapped. This was later improved under T C’s son Haydn (Maxwell Hayden Denne, 1921-2008) who joined in 1945. Much of the production machinery was devised on site; Haydn built the first fully articulated freezer truck in New Zealand from an old army chassis, beginning what was to become a large custom fleet. 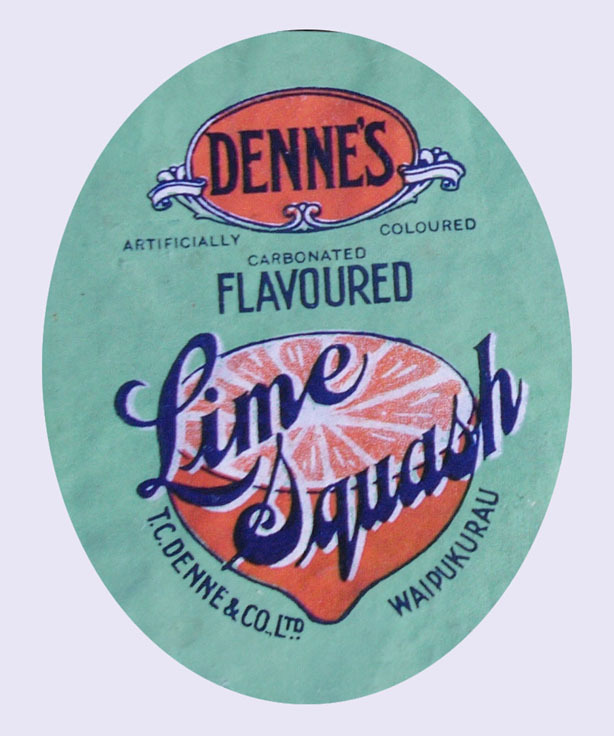 A recreation of the Denne’s soft drink bottle label above, produced between 1928-1938. Image courtesy Tony Smith collection. Haydn became the creative force behind products, developing recipes and techniques, and eventually issuing a new novelty every six weeks. John Denne, T C’s grandson, says: “There were heaps of different flavours of ice cream. But one of the best was Hokey Pokey”. In the early days, the hot toffee was poured into cut down milk powder tins, then smashed and spooned in by hand, as the product exited the churn. Both grandchildren remember that occurring in the mid-1950s and it’s possible Peter Pan were creators of this iconic treat. 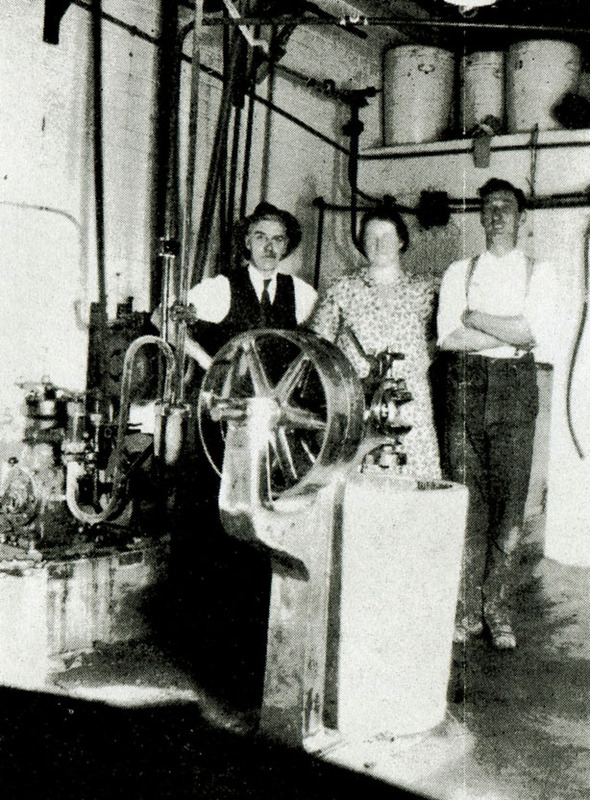 Tom and Agnes Denne on the right, and a refrigeration technician, with their first ice cream churn in 1929. Courtesy of the Denne family collection. Highly popular 1960s novelties included ‘Nutty Cha Chas’, ‘Pink Elephants’ and ‘Jolli-Lollis’ – an iceblock mix in a plastic sachet. “That was an innovation too”, says John, “we may have been first”. 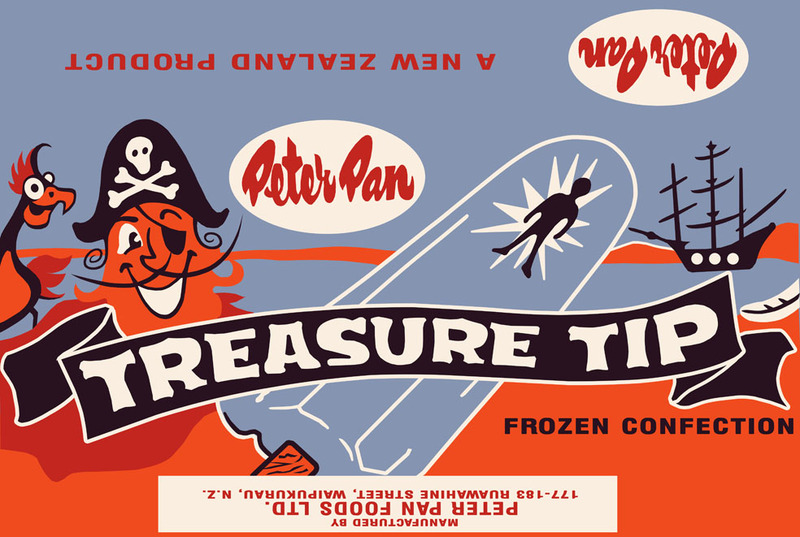 Peter Pan seemingly cornered the market in novelty product – a specialty gimmick were ices with imbedded confectionery. Tony Dean, who worked there from 1966 to 1973, recalls “the Treasure Tip, with jelly babies inserted manually”. Other products were ‘Red Knight’, ‘Honey Bunny’ and the movie-based ‘Hello Dolly’. Many likely capitalised on contemporary popular culture, and were promoted with colourful, garish advertising by artist Bob Godfrey. 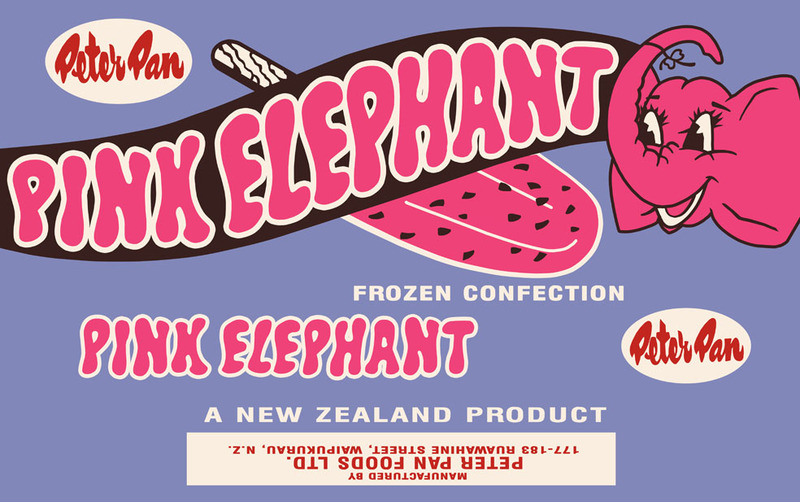 Recreation of a mid-late 1960s wrapper for the Pink Elephant novelty, designed by Bob Godfrey. I stumbled on this story through the sale of a poster lot at auction. Yvonne says “He had a distinct style; posters were printed in his department, originally the local morgue. It still had the marble slabs! When they were rebuilding the hospital, some structures were bought by the company and transferred to the site. The whole layout made use of whatever they found”. 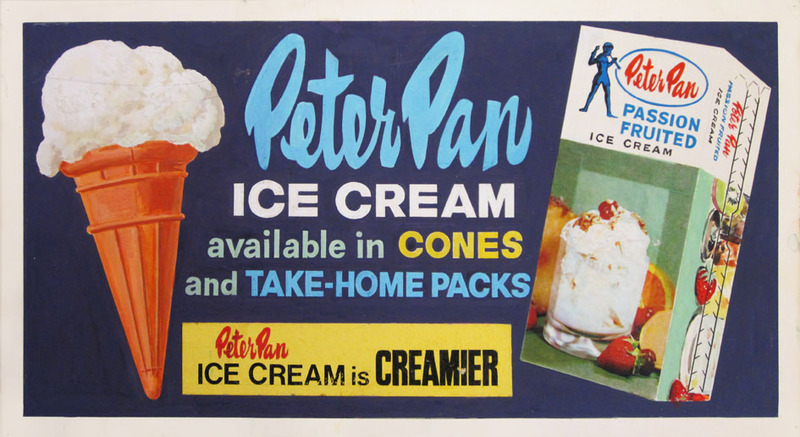 Peter Pan ice cream sandwich board, probably 1950s, image courtesy Cheryl Kelly. T C died in 1950 and his sons assumed his mantle with fervour. John says “Dad handled marketing and sales, Haydn did the production – he had the creativity”. 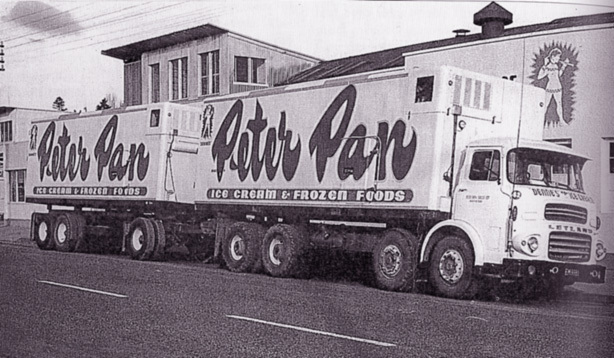 By 1965, under Tom’s management, ‘Peter Pan’ was now the third-largest ice cream manufacturer in New Zealand with 153 staff and 53 trucks covering a network of depots. These stoneware crocks these were first issued in 1928, and then again two years later. A small number of these two issues exist today now selling well into the hundreds each. Image courtesy of Brian Turner. Tony Dean recalls ‘Peter Pan’ also had a contract to distribute Hellaby’s frozen chicken and peas. In the 1960s, this expanded to fish fingers and fillets, squid, beans, mixed vegetables, and corn. John recalls “Sanfords was one seafood supplier. Sadd’s in the South island processed frozen vegetables. Perishability means – to make distribution work you need a good range. It was mainly stores we delivered to – there weren’t large supermarkets like today. Delivering ice-cream wasn’t enough – so over time we developed many products”. Advertising from the 1960s shows frozen pastry, and fast food snacks marketed as ‘Chinese’. There was a line of milkshake syrups, and ‘Tru Fru’ sundae sauces. Hazel Hori, who worked there from 1963 to 1965, remembers “Many Waipukurau people spent part of their lives there. My dad was employed for many years, my mother; my brother, and me – during school holidays.” It was a rite of passage to do a stint before heading out into the world. 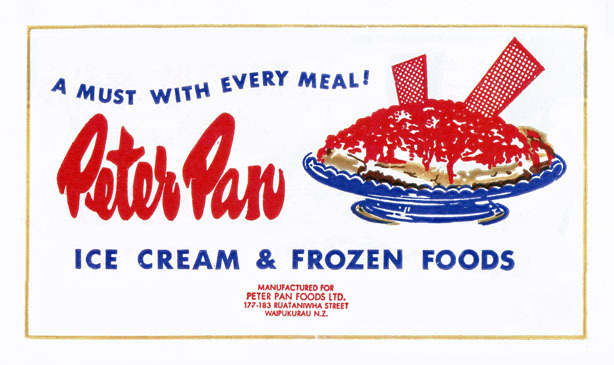 The back of a Peter Pan one pound frozen pastry box, designed by Bob Godfrey, mid-late 1960s. 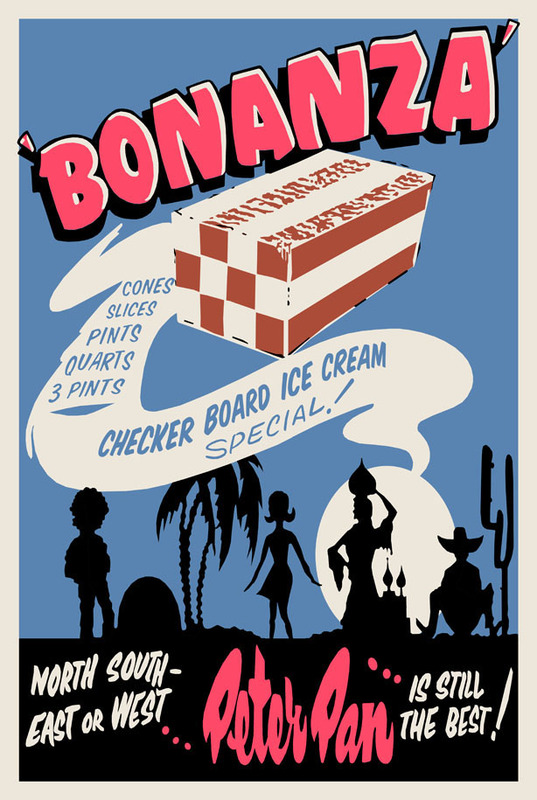 Recreation of a mid-late 1960s hand screen-printed poster for Peter Pan checkerboard ice cream, by Bob Godfrey. In 1964, the Dennes sold shares to Hellaby’s to free up cash flow for their next expansion. Several companies were grouped under ‘Peter Pan Foods Ltd’ in anticipation. Yvonne says “This was significant because it was strictly a family company no longer… the first time they took anything out besides wages”. Peter Pan management Tom (Thomas Vernon) Denne Jr.and Haydn (Maxwell Hayden) Denne, early 1970s. By 1965, Peter Pan was the area’s main employer and it started to expand with a new site, a defunct dairy complex approximately a kilometre further from town. Thus, the factories came to be numbered. Number One was the original site on Cook and Ruataniwha Streets (street numbers 177-183). This was where ice cream tubs, packs, novelties, and waffle cones (also packed in boxes as individual products) were manufactured, and was simultaneously ‘Head Office’. Gradual additions over decades created an expansive jumble. Frozen pastry started at Number One and then moved to the bakery at Number Two factory, further out at Takapu Road, where doughnuts and other goods were made. Number Two focussed on ice confections, as well as ice cream and frozen foods. 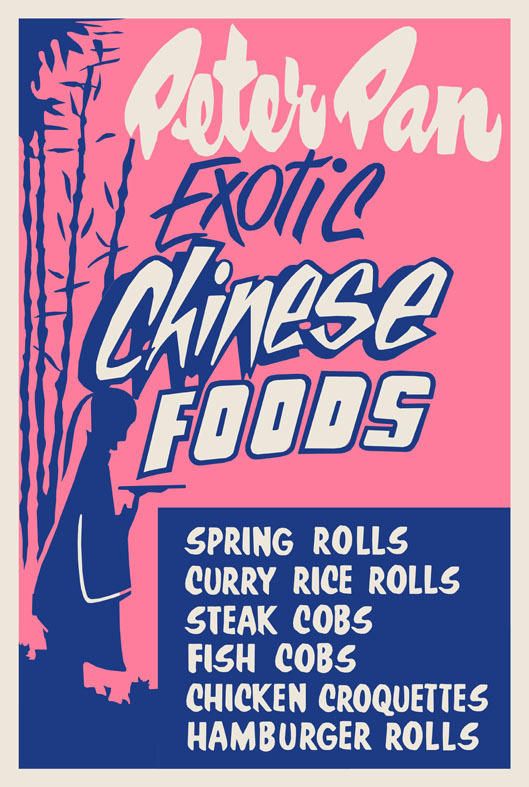 Recreation of a late 1960s hand screen-printed poster for Peter Pan Chinese Foods range, by Bob Godfrey. By 1972, Hellaby’s subsidiary Peach Products owned 50% of ‘Peter Pan’. That year was pivotal to the future of the company, but not for that alone. 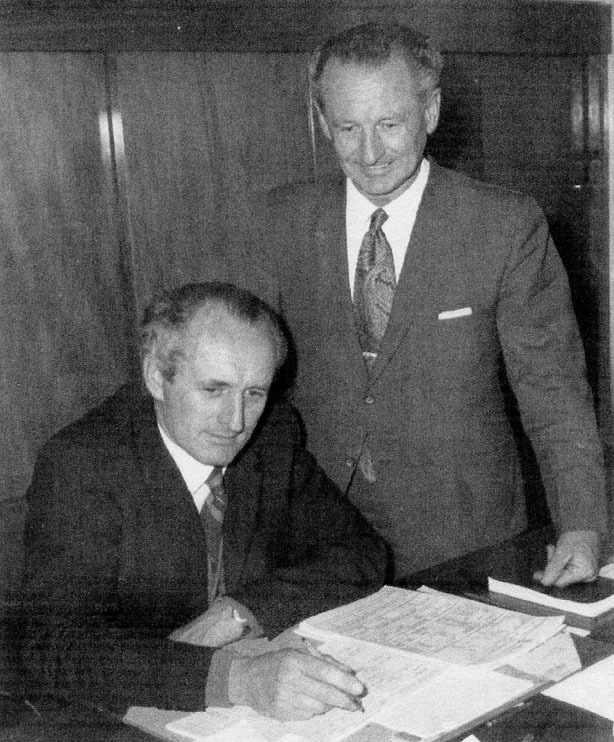 ‘Peter Pan’ had an arrangement with Haighs, a subsidiary of Dalgety’s and one of the largest frozen food producers. Both distributed products reciprocally, an efficient relationship. Problems started when Dalgety’s sold Haighs to General Foods (under the Wattie’s General Foods Corporation umbrella). Recreation of a Jolli Lolli wrapper, designed by Bob Godfrey, circa mid-late 1960s. In 1974, ‘Peter Pan’ was taken over by Hellaby’s, who quickly closed down some branches. There was upheaval in the ranks and an industrial strike in protest. In 1977, Hellaby’s flipped ‘Peter Pan’ to Premier Foods, who closed operations starting 31 March, and commenced to dismantle the company. 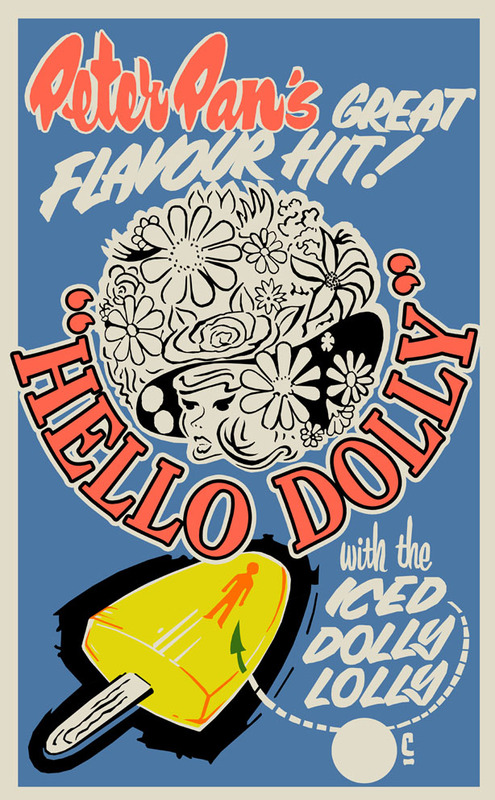 Recreation of a late 1960s-early 1970s hand screen-printed poster for the Hello Dolly novelty, by Bob Godfrey. Through 1977 to 1978, an assistance programme had been initiated by the Department of Labour, and cutbacks continued through 1979 with redundancy packages offered. Soon after that ‘Tip-Top’ stepped in to take on the manufacturing and market core of the business. Most remember the premises operating as ‘Peter Pan Sales, Waipukurau’ until 1986. Then in 1988, the paperwork was filed for closure of the last divisions. 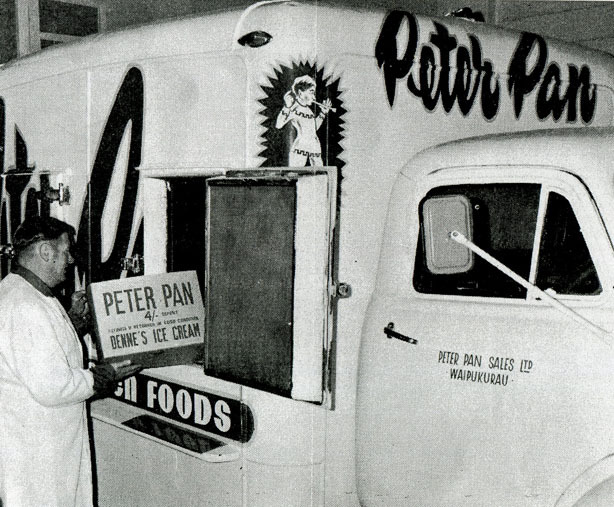 Peter Pan ice cream box and van, 1965. Originally published in Meat Market, R & W Hellaby’s trade magazine. Image courtesy of Hellaby Holdings. 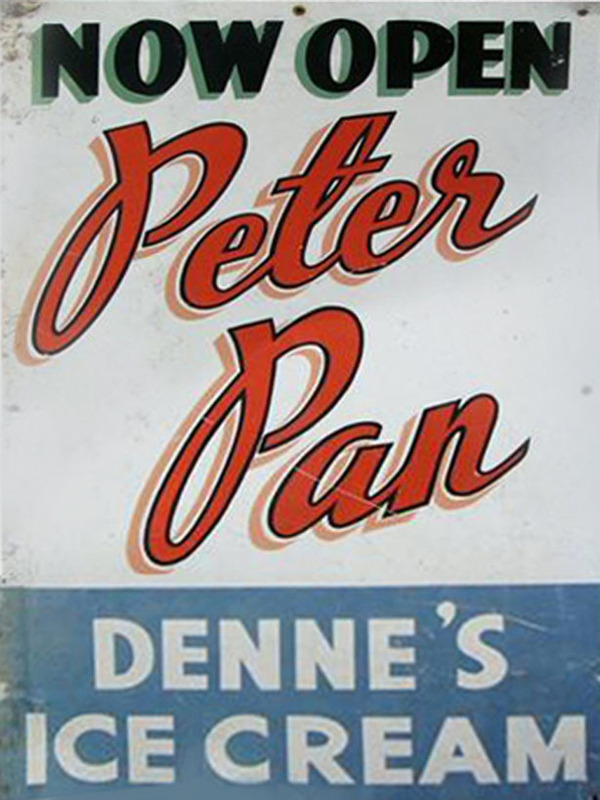 Denne’s soft drink bottle label, 1930s. Image courtesy Tony Smith collection. In 1998 the factory was demolished; the only remains being the mechanics workshop and staff cafeteria; now it is ‘Hatuma Engineering Supplies’. The Number One site is renumbered and renamed. The allotment now has a Health Centre; set back from where the expansive buildings of Peter Pan once represented all that was good. 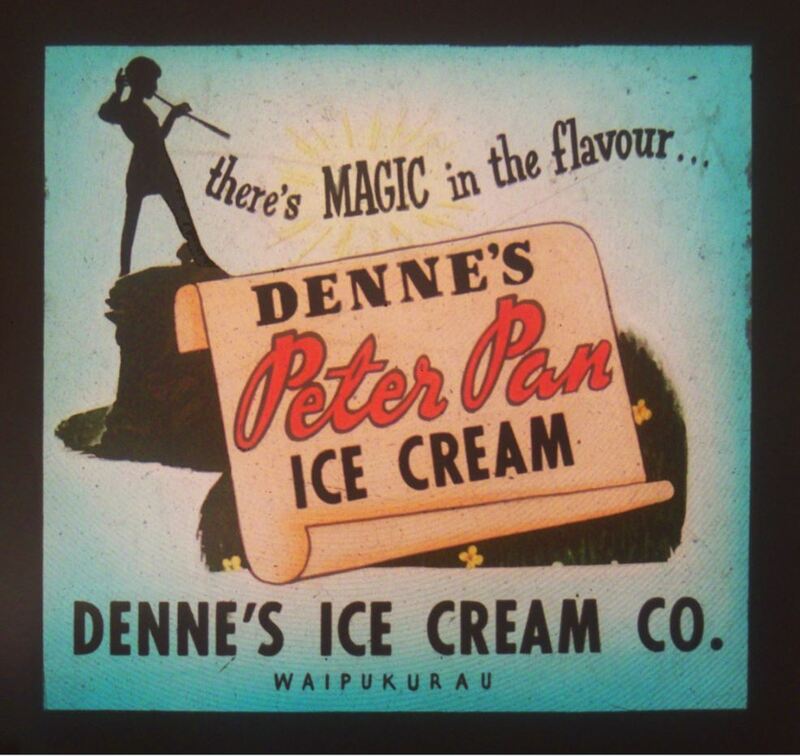 Although the ‘Peter Pan’ trademark remained in limbo for over 20 years, with the rights renewed to ‘Tip- Top’/’Fonterra Brands’, it finally lapsed in 2009, bringing the saga to a close forever. Two Artic trucks outside the Peter Pan factory on Ruataniwha (now renamed to Takapu) road, late 1960s-early 1970s. Author of image unknown. Thanks to John Denne, Yvonne Sutton, and Selina Gentry, all descendants of Thomas Clement Denne, for research material, memories, images and memorabilia. Tony Smith, historian and collector for information on Denne drinks as well as photos of his collection and items of ephemera. Bridget Louise Wellwood , curator of the Eketahuna Mellemskov Museum. Pam Blackberry (1968-1970) and Tony Dean (1966-1973), both ex-employees of Peter Pan Frozen Foods for their recollections of working at Peter Pan. Merrilyn George, historian and author, for research notes. Jana Uhlirova, curator, Central Hawkes Bay Settler’s Museum. Andy May and Donna Gwen Hoby, one time acquaintances of the Dennes. Colin and Esma Stevenson, owners and curators at the Tokomaru Steam Museum. Doug Ellison, Caretaker at Norsewood Pioneer Museum. Jan Gosling, curator at Waipawa Museum. Stanley Fraser, historian. Lisa Truttman, historian and author of the Timespanner blog and the Timespanner Facebook page, and Brian Turner for image of Denne crock. You really have brought ‘Peter Pan’ back to life! I hadn’t heard of this brand before, thanks for sharing its story! As usual the research and visual elements you’ve pooled together are remarkable. I especially like the glass lantern slide. Keep doing what you are doing! Thanks Lemuel. Extracting the images from the glass slides was a difficult business. In frustration I took it to professionals who weren’t able to successfully achieve it. In the end I did it myself by hiring a projector and photographing the screen, then a lot of digital work.